Focus on the present, the glory days of years gone by are becoming insignificant. Focusing on accomplishments from the past two years seems like a good rule of thumb – much like concentrating a resume on your past five years of relevant experience. My Open Source Service is fixed. The problem being that Google Code’s profile page changed and the project list wasn’t being populated – man, I wish Google Code had an API. Anyhow; I added more tests, reduced some technical debt, cleaned up my page sniffer / scraper and things are working again. 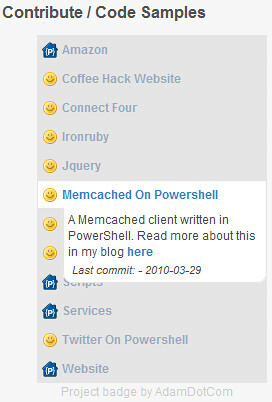 The Open Source Service is consumed by my Project Badge (image on the right). Check out the source code updates. 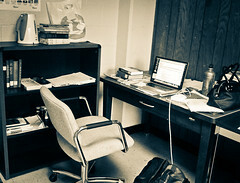 The long term results of a sedentary career (desk job) and lifestyle are frightening. Like many software developer and other knowledge based workers, I can spend up to 10 hours, 5 days a week sitting in a chair looking at a screen. It has been suggested that “[staring at a screen] is associated with lower resting metabolic rate” (TV watching ‘makes you obese’), and regardless of being “slim or fat … every week spent inactive is roughly equivalent to smoking a packet of cigarettes” (Laziness will send us to an early grave). General health guidelines recommended that we “should do a minimum of 30 minutes moderate-intensity physical activity, five days a week” (How much exercise? ), but exercising consistently five days a week is tough without a preferred physical activity. In the years following University I was focused on my career (being active wasn’t a priority) and nearing my 30th birthday I began to realize my sedentary lifestyle was taking a toll on my health. I was becoming a pasty red-eyed developer. Going up stairs was leaving me gasping for air, riding a bike for 30 minutes was painful, and my metabolism was slowing down. I made a couple attempts at becoming more fit. The bike; biking was my first attempt to exercise consistently. Cruising the city on a bike had a low barrier to entry, but getting out of the city required about a 2 hour time commitment, and riding in winter was tough. Rollers stepped in for the winter months, but seemed pretty easy without the resistance – I plan on getting a trainer next winter. Then came the gym, but the time limits on the aerobic equipment were frustrating and I didn’t have a desire to work on bulking up. Enters running. Running offered, the lowest barrier to entry (simplicity, tie up your running shoes and run anywhere), an efficient way to maintain cardiovascular fitness (an intense workout can take 30 minutes or less), and fun challenges (races, community, and competition). I run because it reduces stress, simplifies my focus, makes me feel great, it’s social, and it’s a great way to maintain a fitness base for other pursuits like: biking, hiking, skiing, and even going up the stairs. I run because my career choice doesn’t necessarily facilitate good health.